And here we have the second brigade. Note that the first regiments of both brigades have lapels in the style that's coming into fashion in continental armies. I noticed that the 1st regiment of the 1st brigade also has breeches assorted to the waistcoat: seemingly an idiodyncratic peculiarity? Keep telling us more about the Might of Hetzenberg! Well spotted, Jean-Louis! 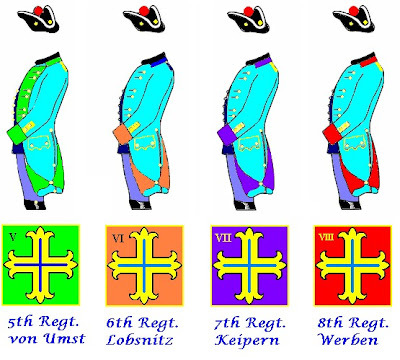 Yes, the inhaber of the regiment, Count Sleibnitz, is an idiosyncratic gentleman. A cousin of the Grand Duke Karl he tends to get away with much that would be frowned upon. The breeches are the main color of his family crest. Since he pays for this peculiarity, no one in the army commissariat is too concerned. I was tempted to conclude from the 'abnomaly' of its uniform that, as the very '1st', Sleibnitz enjoys some peculiar status, some ackowledged form of highest seniority (outside the Guard at least). Maybe its inhaber deludes himself with precisely that idea?